It’s time for my hardback/paperback comparison of the second book in the Harry Potter series. This will be quick. Just like with the first book, there were no differences between the two versions. I kind of wonder when the differences will start showing up. I know for sure they are there in book 5, and I’m pretty sure I’ve heard of one in/from book 4. But even though I didn’t find any differences, these are comfort read books for me and it was nice to take an afternoon to reread this for the twenty-something-th time. Unfortunately, I didn’t have the British version of this book so I can’t do a comparison that way like I did with book 1. However, I did notice a consistency error this time that I’ve never seen before. In chapter 8, The Deathday Party, Hermione tells the others that Moaning Myrtle haunts a bathroom on the 1st floor. A little later that chapter, they run from the basement level up three flights of stairs, then run “the whole of the second floor,” ending up at Myrtle’s bathroom. Those two little references are only pages apart. I checked both HB & PB copies and they both are incorrect/inconsistent. Yes, I’m a dork for picking out little things like this. And yet, I feel dumb for not seeing this before. How many times have I read this? 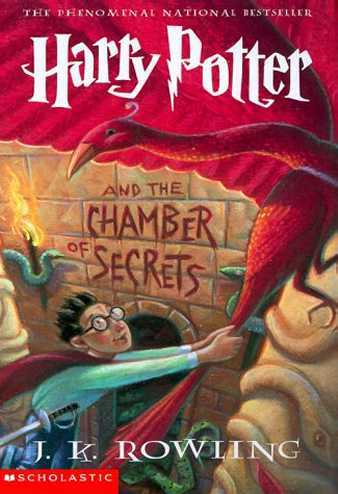 I guess I can only excuse myself because this is one of my least favorite Harry Potter books (the only one worse is The Goblet of Fire) and I tend to skim through it quickly when I read the whole series. I paid more attention this time. I’ll be back next month with The Prisoner of Azkaban, one of my two favorite books in the series! Hopefully I will have something more to say. This entry was posted in 2008, 2009, 2010, 2012, 2014, Children's, Prose and tagged Harry Potter, humor, memorable, multi-read, reread, speculative. Bookmark the permalink.